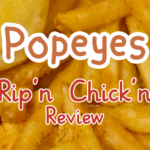 If you’ve been keeping up with Popeyes news (rather than any of the many other things that are going on in the world right now), first off, good on you. I’m sure you’re a hit at parties. Second, you’re bound to already know that this month’s promotional special is the Spicebox Chicken. If you’re not anything like us and feel like there are things more important than what America is eating right now, however, then we’re here to tell you that the Spicebox Chicken is a $3.99 special for chicken (thin strips of white meat, marinated and fried, tossed in a 12-spice blend), fries, a biscuit, and a spiced ranch dipping sauce. 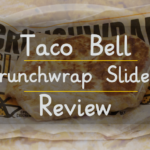 In this review, we’ll be talking not only about how good this tastes, but also about some of the history behind the difficulties that fast food chicken restaurants have gone through. Good fried chicken is hard to come by in the North. We’re not going to discredit the excellent food available at many locally-owned fried food restaurants – seriously, if you’re in the South Minneapolis area, look around – but when it came to chain restaurants, the fare was greasy, slimy, and all around gross. Oh, how we languished in fried chicken obscurity until the day that Popeyes opened its doors for all to see! Real, crisp, flavorful fried chicken was finally available to the masses! But the road to this was no simple walk in the park. Popeyes in the Twin Cities area has had a strange and murky history. A few years back, the only Popeyes in the region was a singular one located in Lake Street, with its own obscure behavior such as a strict cash-only policy. This all changed when Wagstaff Management, a Californian owned KFC franchisee, declared bankruptcy in 2011 and eventually decided to liquidate its Minneapolis-area restaurants. Although KFC corporate bid to regain its foothold, Popeyes won the 14 locations, with the creditors for the restaurants not even wanting to deal with KFC again. Really, who could blame them? From our experiences, the local KFCs had gone majorly downhill in the past few years. Whether it was bad decisions from corporate to simple incompetence at a storefront level (we have memories of when grease didn’t drip down your chin once you bit into a KFC drumstick), KFC had such little going for them it’s no surprise they lost so much ground. And this isn’t the only trouble KFC is having: competitors such as Popeyes, and even the legendarily LGBT-hating Chick-fil-A, have been taking up much of their potential market share. Their food isn’t innovative, and they haven’t pushed out any new meaningful offerings in years. The few things they have introduced have been widely regarded as terrifying and confusing, ranging from the Double Down (a cheesy bacon sandwich with fried chicken filets instead of buns) to the Famous Bowl (hot chicken, potatoes, and gravy mix together with cold corn and cheese to make a lukewarm disaster). Yum! Brands are the corporate owners of Taco Bell, KFC, and Pizza Hut, and all these brands have one thing in common: a complete sense of disregard for the definition of ‘food’ and ‘fun’. 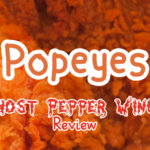 It’s easy to say that after having to watch our childhood favorite restaurant KFC take a tragic decline into repugnance, the opening of local Popeyes restaurants truly gave us the first breath of stale, greasy air we had experienced in a long time. 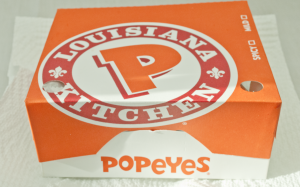 One of the interesting things that Popeyes does is that they tend to release monthly specials, each one with their own unique variation on the standard Popeyes chicken (last month’s special was Beer Can Chicken, which did not really taste like its namesake, but was damn good regardless). This month, they’ve released the “Spicebox Chicken” box, a combo box based around the contents of a traditional Louisiana spice box. Claiming a combination of twelve different flavorings and seasonings, the Spicebox Chicken is said to be something to “warm up the month of December”. We dove in with excitement to see if this spicy concoction will really warm up the chill. This Spicebox is missing its box! The very first thing to note here is that, according to the promotional material, the Spicebox Chicken was supposed to be provided in a specialty box with a slide out compartment just like a real spice box. Ours was provided in the standard flip-top box; not a huge disappointment, but missing out on the novelty factor is one of those little tragedies. 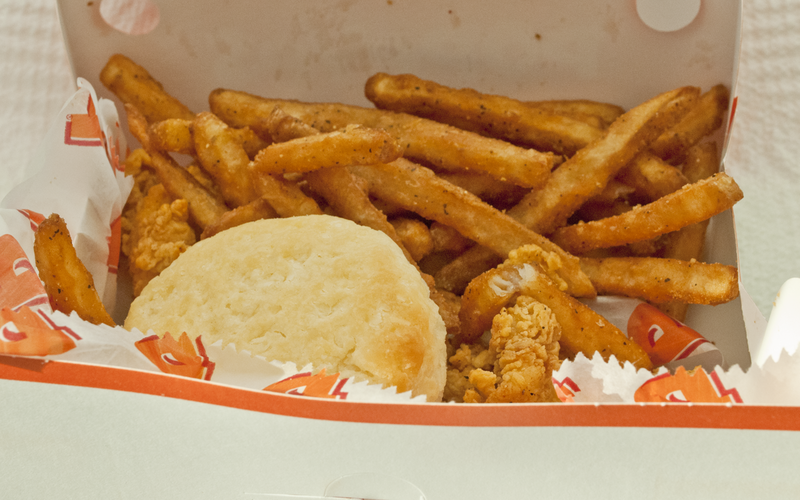 The box was stuffed with french fries, making it hard to find the chicken. 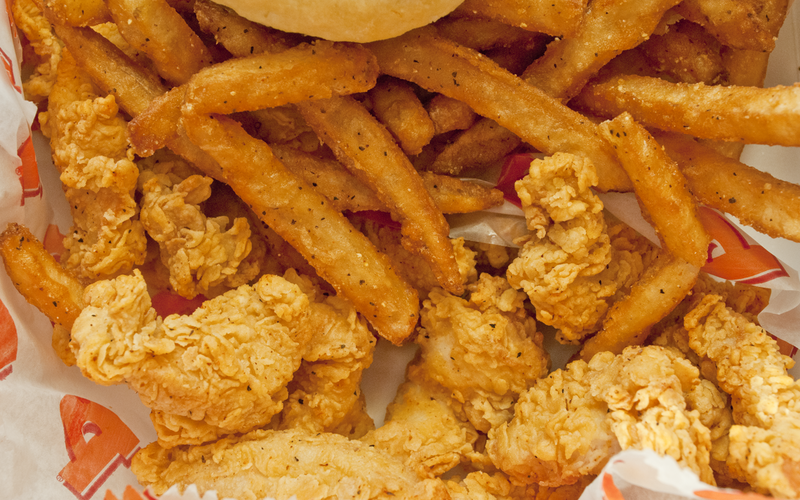 Taking the first bite of the chicken can only be described as “amazing”. The chicken is tender and juicy, with a crispy coating that provides real crunch without being chewy or squeaky like some less-than-appealing chicken breadings. The spice factor is really heavy in play, but not just with burning heat. The spice blend is complicated and provides an excellent texture of flavors across the tongue. Most prominent is black pepper and cumin, but garlic, onion, and red pepper flavors are also very notable. The strips were inconsistently sized; some were the size of popcorn chicken, while the largest were the size of chicken tenders. Be careful if you’re going to share this with a friend! The default dipping sauce option provided for the Spice Box Chicken was Blackened Ranch, a buttermilk ranch dressing mixed with a Louisiana blackened spice blend. This was a perfect accompaniment to the chicken. The creamy flavor and texture of the ranch helped temper the heat of the spice, while the added spices gave it some extra punchy heat. We don’t know exactly what the blackened spice mix is, but the overall flavor it gave was highly reminiscent of Worcestershire sauce. Accompanying the chicken was a side of Cajun Fries and a single buttermilk biscuit. The fries were extremely good; they are the perfect middle ground between those who would like their fries crispy and those who would like them soft and chewy. 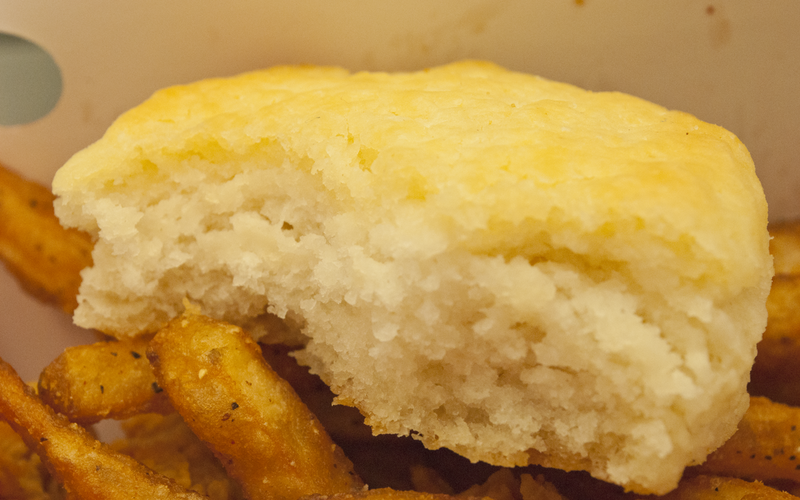 The biscuit was warm, fluffy, and buttery, with a crumbly crust and a soft, flaky interior. It’s absurdly superior to KFC’s biscuits, which resemble flavorless, crumbly hockey pucks. The fries and the biscuit both taste amazing when dipped in the ranch, which makes it a wonderful and satisfactory experience that ensures that nothing will be left behind when you’re done eating it, and it will still leave you pleasantly full. 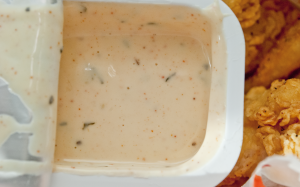 It’s too often in this world to be provided with food that either leaves you hungry or with too many inedible leftovers (unless you’re a miserable person like Warden, whose only pasttime is sticking his face into entire tubs of nacho cheese dip), so it’s nice to have a perfect sauce-to-food ratio like this. Popeyes is nothing short of a treat on the occasions we decide to pick some up. 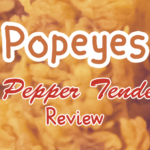 Although most of Popeyes’ menu is a bit too pricey to eat regularly, their monthly specials are in that perfect crossover of affordable and delicious that demands sampling. The Spice Box Chicken is no exception to this trend. With enough food in a single box to make a full meal for a single person, or even a good meal to split with a friend, this promo item can’t be resisted. The only downside is that this will item will be gone by January – but at least we’ll have a new promo to look forward to!